While the North of Italy is well known for gems such as Milan, Venice and the lake district. Few are aware of the stunning area of Lombardy called Valtellina. Beginning shortly after the peak of Lake Como and stretching west to Switzerland and east towards the Dolomites, this lesser known pocket of Northern Italy has much to offer and is wholly unspoiled. An important location on the border of Italy and Switzerland, this valley has been a long fought over trading route throughout history. The activities on offer here now are varied and year round. Skiing and husky dog sledding in Winter; (the village of Bormio hosts an annual World Cup Downhill competition each year). Hiking, horse riding or cycling in Summer. 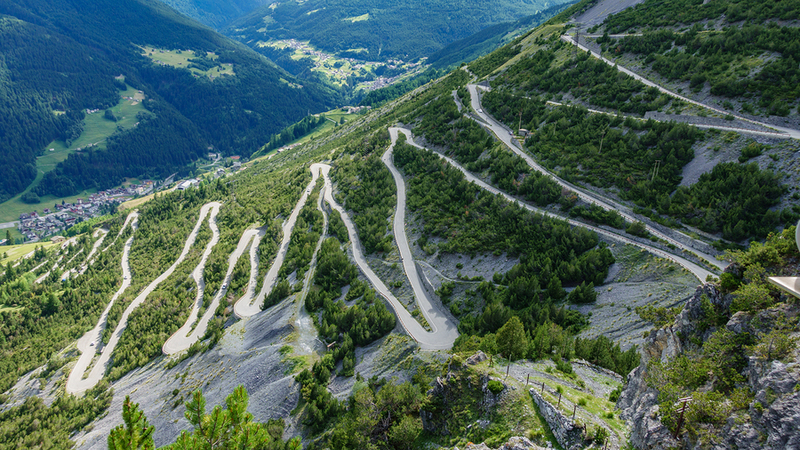 The famous Passo dello Stelvio is situated here. There are mountain spas and spectacular train journeys traveling as high as 2,253 meters above sea level. 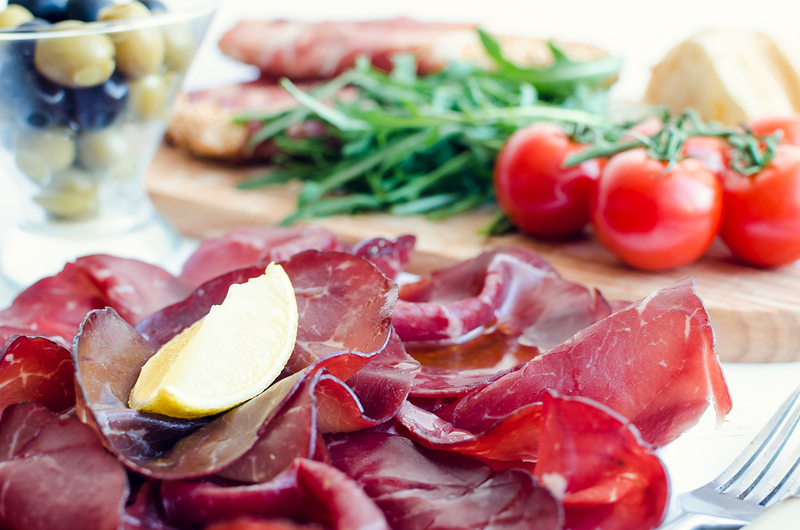 However, if all that exercise is too much; what makes Valtellina a delight is experiencing the enticing cuisine. Typical of most areas in Italy this region uses the best of its local produce to create simple dishes which have changed very little over the centuries. Being a colder mountainous area hearty, comforting dishes are prolific. Delicious cheeses, prosciutto, and polenta. Local wines produced in small vineyards that hug the slopes of the mountains in long delicate spidery lines and are harvested by hand due to their precarious position. While we all think about pizza and pasta when visiting Italy; and you can still have them here! It’s important to note that Italian food is reflective of its location. In the colder North, you need Ossobuco and polenta to sustain you. In the South, with the insatiable heat, you are refreshed by a seafood spaghetti! With this in mind in Valtellina, you are surrounded by beautiful, vast expanses of countryside and mountains. You reap the benefits of exceptionally fresh air, mountain spring water, and deep sleep. So most importantly you also need filling wholesome meals. Bresaola. A distinctly dark red, almost purple! Salted, air-dried beef. It’s cured with a rub of juniper berries, cinnamon, and nutmeg. Served in a variety of ways but always sliced incredibly thin. It can be eaten drizzled with lemon juice and olive oil. With another mouth-watering prosciutto ‘Lardo’ which is finely sliced lard cured with salt, black pepper, rosemary, and garlic. It can also be paired with porcini mushrooms in olive oil or with a large slice of Ricotta d’Alpe, a fresh alpine ricotta. Sciatt. Meaning ‘toads’ in Valtellina dialect. Possibly as these are little crunchy balls and have irregular shapes. They are produced by taking little pieces of cheese dipped in a batter of buckwheat flour, frying them and serving on a bed of chicory. The bitterness of chicory mixed with the gooey cheese and crunchy coating is divine. 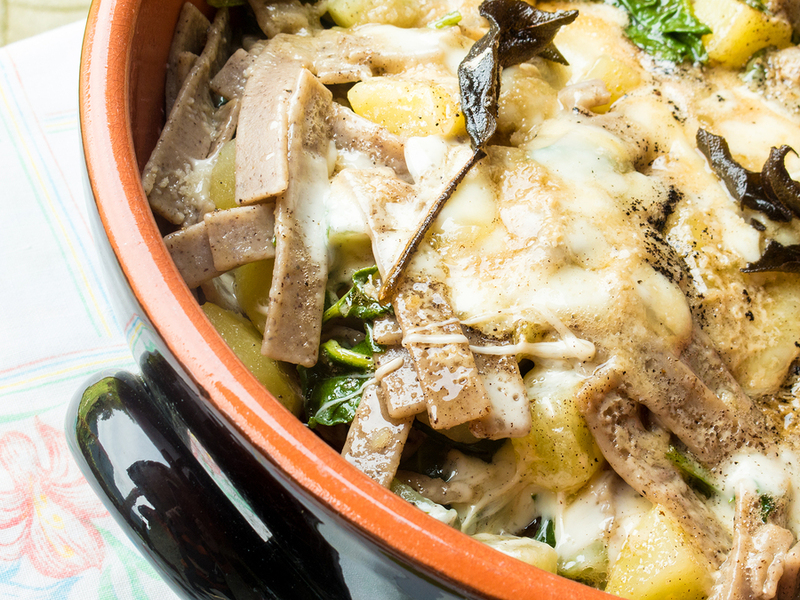 Pizzoccheri. 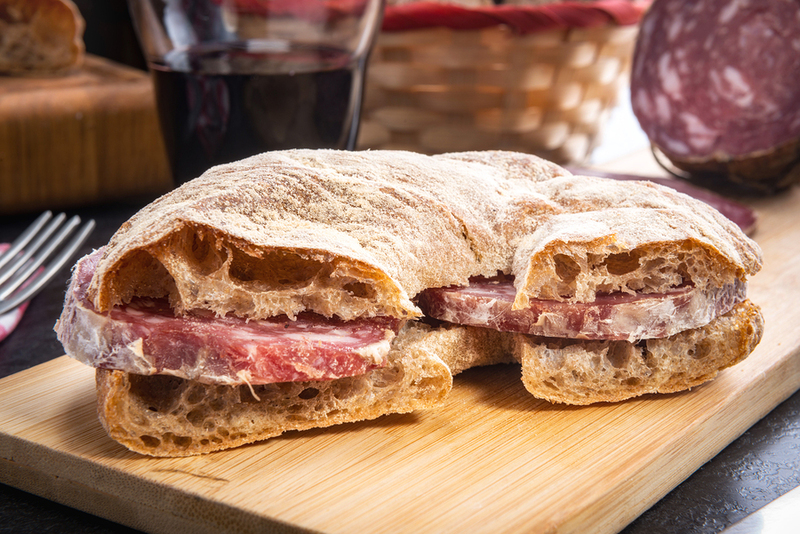 One of the most famous dishes in Valtellina and enjoyed all over Lombardy as it’s so satisfying. This is often on the menu in ski resorts as it’s the perfect plate after burning off so much energy! This pasta dish is made with buckwheat tagliatelle style ribbons, soft white potatoes, cabbage, melted Casera cheese, and sage butter. If you want to recreate it at home, the hard to come by Casera cheese can be substituted with Fontina or Asiago. Polenta con cervo. While you can find this dish elsewhere in Lombardy, in Valtellina the polenta is usually ‘grano saraceno’ meaning buckwheat instead of the well known yellow cornmeal variety. It’s also served with cervo which is very tender venison. The medallions of meat are covered in a gravy of red wine, rosemary and olive oil. Bitto & Casera. 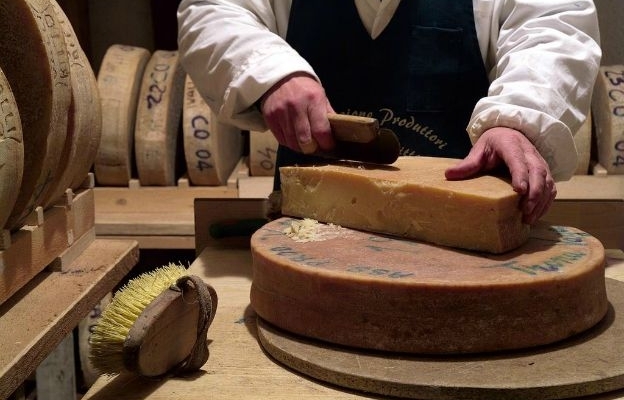 Both of these alpine cheeses have Italian DOP status, a protection of origin. They are created solely in the Province of Sondrio in Valtellina. Named after the Bitto river, this variety is only produced in the summer months when the cows feed on the high alpine meadows. Bitto has a slightly spicy, intense flavor, is firm and can be grated. Casera, so called due to the ‘casere’ or stone buildings the wheels are kept in to mature, has a sweeter more delicate taste. Infused with the aroma of mountain herbs this cheese is very versatile and used in many Northern Italian dishes such as the Sciatt and Pizzoccheri above. However, both are just as delightful sliced with some local bread. Pane di Segale. This is a rye bread originally created because it can be kept for days and still maintains its flavor. Usually sold in the attractive ciambella (doughnut) shape these rings of bread are found all over the valley. Enjoyed simply with salumi and cheese. Or with butter, jam or honey. Dolce. 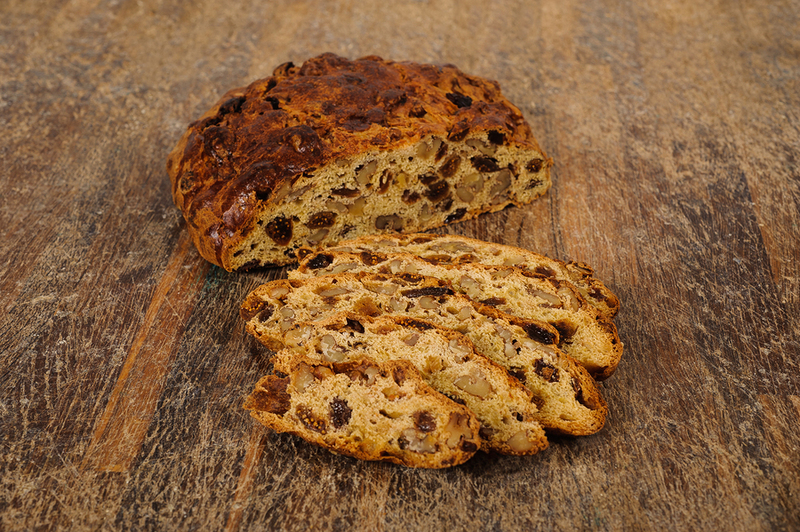 Sweet treats in Valtellina are noticeably firmer, rich cakes such as ‘Bisciola’, a round, rustic bread made with raisins and walnuts. Or variations of the flat, wide and delicious ‘Torta di Noci e Miele’, made with walnuts and honey. In Tirano; a beautiful mountain town with a stunning Basilica. The apple orchards here produce a large proportion of Italy’s apples. Due to this abundance within Valtellina many desserts contain the local fruit which thrive in the mountain soil and are grown without pesticides. Wine: To accompany the dishes above you need some excellent wines This valley is famous for ‘Valtellina Superiore’, which has full DOCG status. Crimson in color and with an unmistakable aroma of cherry and rose. It is produced from the Nebbiolo grape variety and has very strict growing conditions. The other main variety of wine produced here, which is similar to Amarone, is called 'Sforzato di Valtellina'. Both of these are located on the slopes above the five villages of Grumello, Inferno, Maroggia, Sassella, and Valgella. The vineyards are situated on steep hillsides, and grow in a sunny south facing position. Braulio. If you like to finish your meal with a digestivo, try a sip of Braulio. A traditional after-dinner liqueur with a strong, herbal flavor. Dating back to 1826 and created by Francesco Peroni, a botanist who studied the beneficial properties of various local herbs. The liqueur is full of medicinal herbs, fruits, roots and berries which are grown locally. It has a strong flavor and is rather an acquired taste! You can visit the Braulio shop to try for yourself at Via Roma in the village of Bormio. I hope this has inspired you to take a trip to a lesser known area of Italy and enjoy these gastronomic delights for yourself. Receive Stories About Italy Every Week!